Christmas 2012 Pepper-Nuts shared with our neighbor, Marilyn. Happy Holidays from Amil’s Inn Bed and Breakfast! It has been such a wonderful Christmas season here at Amil’s Inn. We have been busy serving guests and focusing on the real meaning of Christmas—celebrating the birth of Jesus. We would like to share with you a favorite German cookie recipe that was shared with us many years ago by our neighbor, Marilyn Roerig of Sparta, Wisconsin shortly after we were married. Now 30 years later, I visited Marilyn and gave her a small glass jar full of Pepper-nuts or as some say ‘Pfeffernusse’. I really enjoy putting on a kettle of hot water and sipping on a cup of tea. 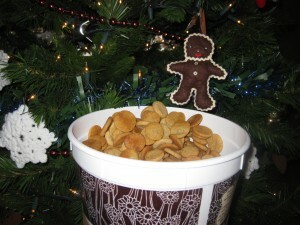 So, even though it’s after Christmas, why not invite a neighbor or friend over and enjoy some Pepper-nuts! Plan on a whole afternoon baking because it makes an ice cream bucket full of cookies. Boil together a few minutes. Stir well. Make rolls about 12” long and 1/2” thick. Cut rolls about ¼” thick. Put on greased baking sheet or parchment paper 2” apart and bake at 375 degrees for about 4 minutes-be sure you watch these closely. Remove immediately from baking sheet when taken from oven. Store in a tight sealed container. I usually store them in a clean ice cream container.